After breakfast take sightseeing tour of historic city visiting Old Delhi visiting the majestic Red Fort, a marvel in red sandstone, Jama Masjid, the largest mosque in India, both built by emperor Shah Jahan of Taj Mahal fame, Rajghat - memorial of Mahatma Gandhi & a Rickshaw ride past through the silver street in Chandani Chowk, the city tour continues covering New Delhi, visiting Rashtrapati Bhawan, one-time imperial residence of the British viceroys; the India Gate, a memorial raised in honour of the Indian soldiers martyred during the Afghan war; the Laxmi Narayan Temple, built by the Birlas, one of India’s leading industrial families; Humayun’s Tomb, lotus shaped Bahi Temple , Qutub Minar , built by Qutub-ud-din Aibek of the Slave Dynasty; in the evening you can visit see speculative Light and Sound Show at Red Fort. Overnight at hotel. Morning drive to Jim Corbett national Park. On arrival check into hotel. The Corbett National Park is located in the foothills of the majestic Himalayas in the state of Uttranchal in India. The Corbett National Park is home to a variety of flora and fauna. It is famous for its wild population of Tigers, Leopards and Elephants. Once a popular hunting ground of the British, the Corbett National Park was named in honour of the late Jim Corbett, the legendary hunter-naturalist turned author and photographer, who spent most of his years in this area and contributed in setting up the park. Afternoon have lunch and proceed for a jungle ride on Jeep. Dinner and overnight at hotel. After Breakfast, take Half hour drive towards north to Durga Devi. With packed lunch ride on the Indian Elephant and commence a whole day Safari (15 kms). Packed lunch enroute. In the evening arrive Lohachor for Dinner and overnight stay. After breakfast then proceed on your sojourn with packed lunch. 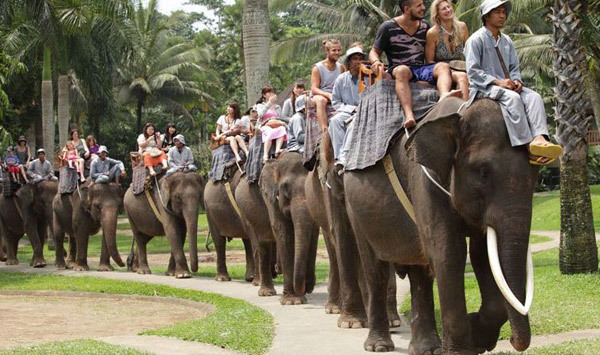 Whole day Indian Elephant Safari. Arrive Ratwadhap for hot dinner and overnight stay. After breakfast proceed for the whole day Indian Elephant safari with packed lunch. Arrive Haldupura for dinner and overnight stay. Breakfast at Hotel, Drive to Delhi, on arrival, you are free to enjoy your rest of the time as per your activities. In time transfer to International Airport for your flight back to Home.